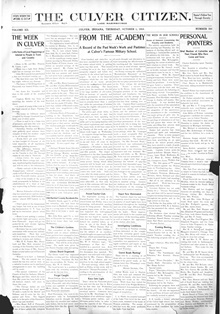 Complete run of 1914 Culver Citizen newspapers is online now! It was the year World War I began, though in Culver it was the year electricity arrived in town, the public library was launched, and an array of roads went from muddy wagon tracks to gravel, among other news of note. The entire year’s worth of Culver Citizen newspapers from 1914 is available, full-text and searchable, to add to our existing collection of more than 20 years’ worth of Culver newspapers, which can be accessed here. Choose a link below to start your trip back to 1914!